Looking to pick some brains on your thoughts please. Ok, here goes - I'm fortunate to have 2 Prestige 250's (both absolute stunners). turn the volume off on the pickup totally. If turned to zero, the volume output remains at about 50%. When turned up to 10, yes, the volume increases to full. Just for reference, this guitar has not been abused in any way and appears to have not been played at all - it's about 9.5 / 10 ! So, I did the obvious thing - took the backplate off and gave the volume pot (potentiametor) a good old spraying with Servisol 10 contact spray / cleaner and worked the vol poy back and forth. Reassembled, but no joy here - still the same. Next step ..... check out my other 250 and take a peek inside the back cover and compare the wiring harness to see if there were any obvious abnormalities and so, I found something that I consider 'strange' regarding the volume pots. Given that they are both the same model and both 1982 (I believe), there IS a bit of a difference. 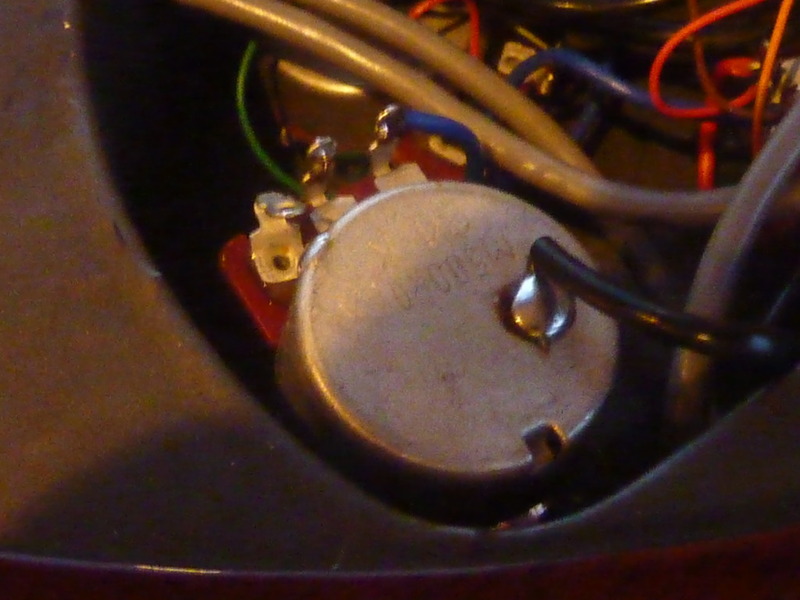 On Prestige number 1 (volume pot works perfectly), there is a 'jumper wire' that has been soldered between 'tag 1' on the pot and the back of the pot. 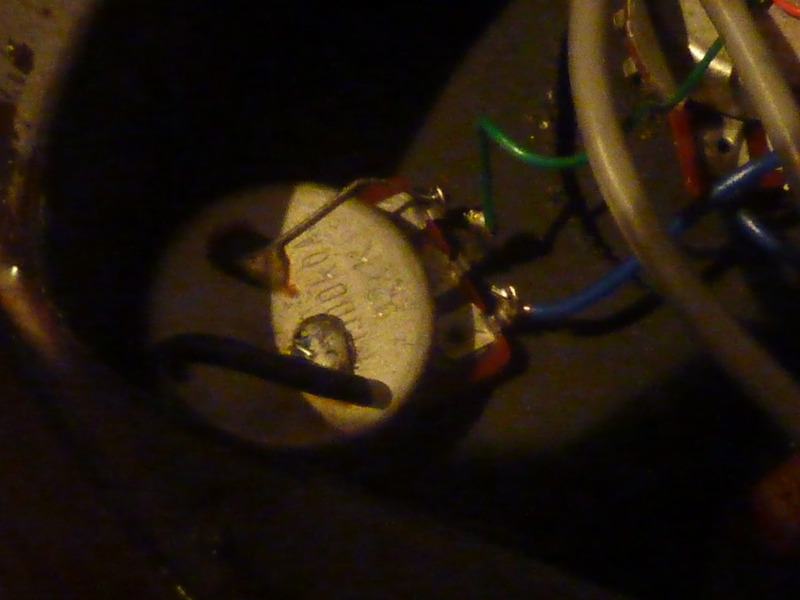 On Prestige number 2 (volume pot does NOT switch off at zero), this 'jumper wire' is not present ....only the green and blue wires to the tags on the pot. So, my question is guys, could Prestige number 2 possibly have been a slight 'factory fail' whereby the assembler forgot to solder a 'jumper wire' and hence rendering the volume pot on the bridge pickup not to turn the volume down to nowt / zero / silence / nada etc? In your humble opinions / knowledge, do you think that this 'jumper wire' is the key to zero volume? FYI - I have looked at wiring diagram for a Rainbow (which I believe is same as Prestige) and it shows the 'jumper wire' on the pot ....but obviously I do not know what the purpose of this particular jumper is. Just to add a little bit more ....... notice that there is a 'blob' of solder on the back of the pot opposite 'tag 1' ..... so was this put there in preparation to solder a 'jumper' across the two points? The plot thickens! Noticed pics have uploaded successfully - so pic1 is from Prestige number 1 whereby vol pot for bridge pickup works perfectly. bend the tab a little more or use a jumper wire, makes no difference. just connect the tab to the back of the pot and you are good to go. Many thanks for the quick reply Gittarasaurus. Will do. So my suspicions were correct then! So thats 4x250s within 1/4 mile. Happy to fix for you if your soldering skills not up to it. Must come and see your band.